LORDE was swamped by fans and media when she arrived home this morning after her success at the Grammy Awards in Los Angeles. The 17-year-old said she was "very tired" after she walked out the arrivals doors at Auckland Airport to the shrieks of adoring fans and and the clicks of hundreds of cameras. She spoke briefly to the large media scrum before leaving in a taxi, accompanied by her mother, father and band members. She said she was "freaking out" when she won two Grammy Awards, but said it was "super cool". Lorde, who has spent the last few days mingling with some of the world's best musicians and even dancing with Sir Paul McCartney, said the person she met who she was most impressed with was probably pop diva Beyonce. Asked what it was like to have become something of a national hero, she said "I did gain like 200,000 Twitter followers". 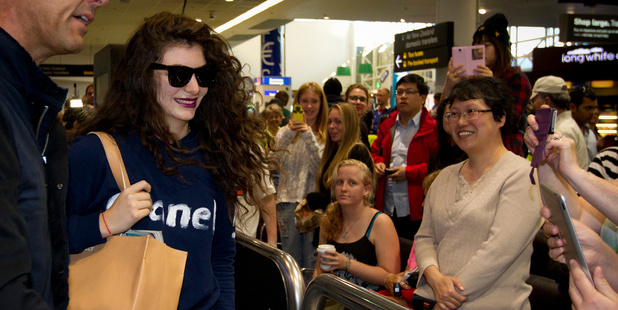 The 17-year-old picked up two gongs at the Grammys, and fans and a large media contingent gathered at Auckland Airport this morning awaiting her arrival. "I just like the fact that she's a Kiwi chick who's made it so big in other countries," said Cara Gibson, 15. "I really hope I can get a photo with her ... It'll go straight on Facebook." Jenny Brown said she was in awe of the North Shore teenager. She said Lorde's Grammy performance "blew me away". "Especially compared with all the glitzy Americanised acts that played. Then you get this Kiwi girl who's just standing there singing her heart out. It makes you proud to be a New Zealander."